Bottled my Honey Lager today. One of the best purchases I made for my home brewery has been without a doubt my chest freezer and thermostat control. It allows me to store my bottles and kegs at proper temperatures. It also allows me to brew lagers. For those who don’t know the differences between ales and lagers, time for a quick lesson. In brewing beer there are 2 main types of yeast. Ale yeast and Lager yeast. These yeast use to have different scientific classification Saccharomyces uvarum (Lager) and Saccharomyces cerevisiae (Ale). Today, as a result of recent reclassification of Saccharomyces species, both ale and lager yeast strains are considered to be members of S. cerevisiae. The strains that are typically considered “Ale” yeast ferment at temperature ranges between 50-78 degrees. Ale yeasts are generally regarded as top-fermenting yeasts since they rise to the surface during fermentation, creating a very thick, rich yeast head. That is why the term “top-fermenting” is associated with ale yeasts. Fermentation by ale yeasts at these relatively warmer temperatures produces a beer high in esters, which many regard as a distinctive character of ale beers. Lager strains typically ferment between 40 and 55 degrees. At these temperatures, lager yeasts grow less rapidly than ale yeasts, and with less surface foam they tend to settle out to the bottom of the fermenter as fermentation nears completion. This is why they are often referred to as “bottom” yeasts. The final flavour of the beer will depend a great deal on the strain of lager yeast and the temperatures at which it was fermented. Because of the lower temperatures, “lagering” can take weeks or even months. (Note: lagering is German term which means “to store”). Most homebrewers and many microbreweries only make ales. My favorite place in Knoxville, Downtown Grill and Brewery is a perfect example. Large scale lagering equipment is very expensive. If your customer base is happy drinking ales, why make the investment? So this Honey Lager me and my bottling elf bottled today is only the second true lager I have ever brewed. Not that I haven’t used lager yeast strains before, but I always fermented them at ale temperatures The first true lager I made was a german style Rauchbier (pronounced “row” like “cow” and “ch” like “x” in “Mexico”). I brewed it in middle of winter. It was lagered in a back room that stayed a constant 40 degrees. It was incredibly rich and delicious and something I will definitely brew again. 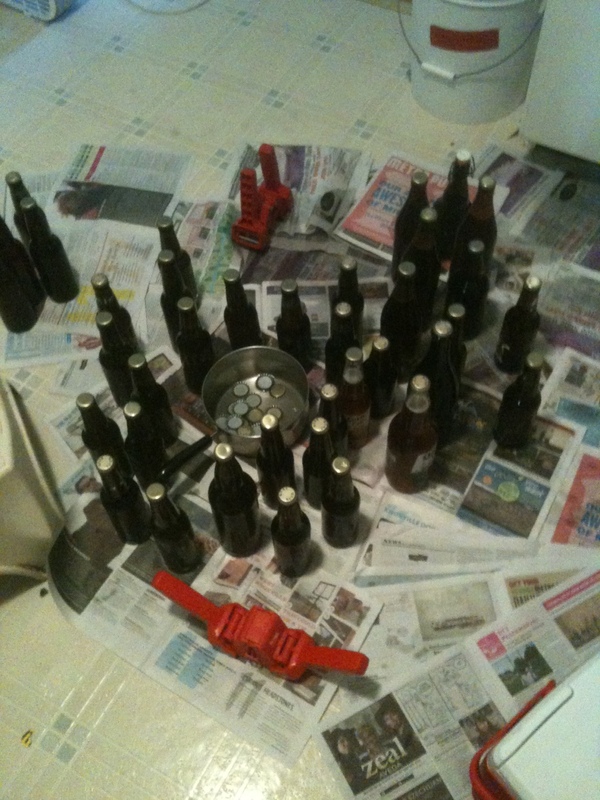 The lager bottled today was brewed the end of April. After the 2 week primary fermentation, I racked it into another carboy, put the carboy in my chest freezer and slowly lowered the temperatures a couple of degrees each day over the course of a week until it was at 40. I lagered it for 6 weeks. 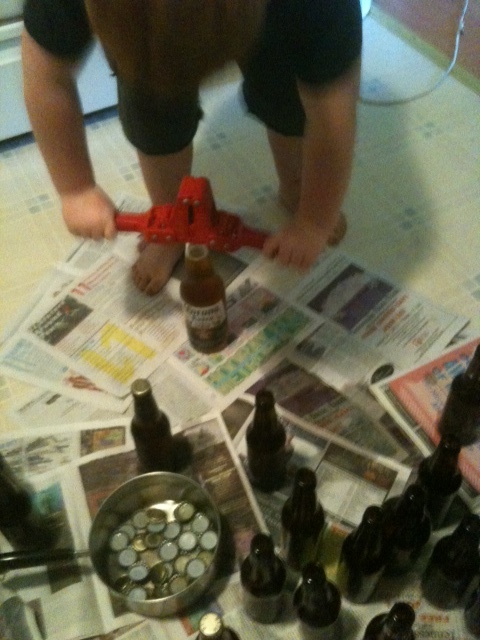 My bottling elf (my 7 year old son, Orion) was happy he’d finally get to use the extra bottle capper I gave him. We added the priming sugar (4.5 ounces of dextrose) to the bottling bucket and filled 37 sanitized bottles of various sizes. At the bottom of this post, so can see a picture of him in action. Next I will let the bottles sit out in a cooler near one of my air conditioning vents for a week to allow carbonation to take place. Then it’s back in the fridge for a month of bottle conditioning. Finally, in the heat of August, I will have a nice crisp refreshing honey lager to enjoy. All that work and waiting will be well worth it. Honey Lager recipe, based on the recipe from Charlie Papazian’s The New Complete Joy of Homebrewing. I used Wyeast 2035 American Lager yeast. I will report back in a month or so with tasting notes. This entry was posted on Sunday, July 3rd, 2011 at 01:34 and is filed under Uncategorized. You can follow any responses to this entry through the RSS 2.0 feed. You can leave a response, or trackback from your own site.